"We view conversational technologies as the future of the traditional e-commerce experience. Dialogflow helps us stay ahead of the curve." Assisting a user with simple requests. Conduct transactions with your users on their preferred platform, at any time, from anywhere in the world. Make it easy for employees to access critical business information and improve productivity (e.g. provide sales with information about local opportunities). Give users new ways to interact with your product by building engaging voice and text-based conversational interfaces powered by AI. Connect with users on your website, mobile app, the Google Assistant, Amazon Alexa, Facebook Messenger, and other popular platforms and devices. 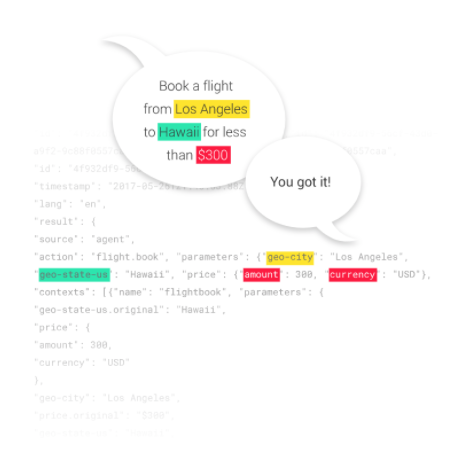 Dialogflow incorporates Google's machine learning expertise and products such as Google Cloud Speech-to-Text. Dialogflow is backed by Google and runs on Google Cloud Platform, letting you scale to hundreds of millions of users. For more information on how Chatbots can help your company please contact us.